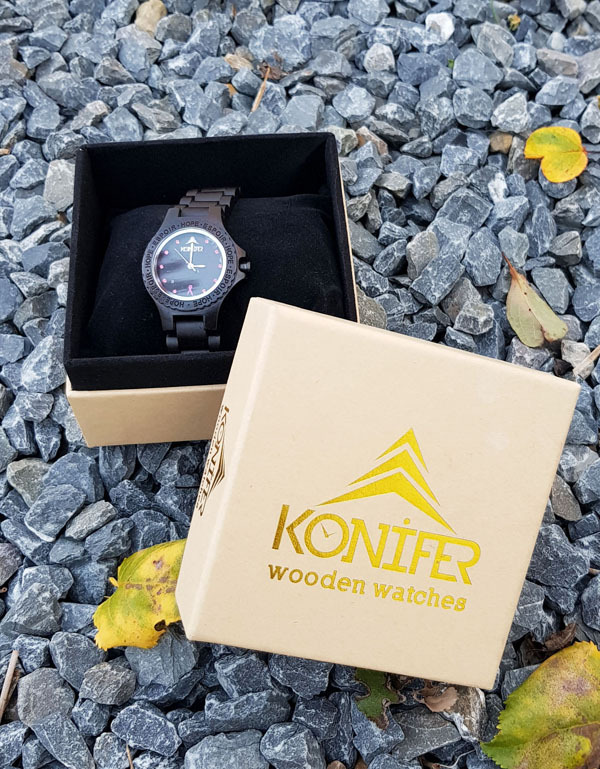 Konifer is a brand based in Canada, created in 2012, which was birthed out of passion for watches and wood. This is probably why most of their watches have the iconic maple leaf logo which immediately brings Canada to mind. 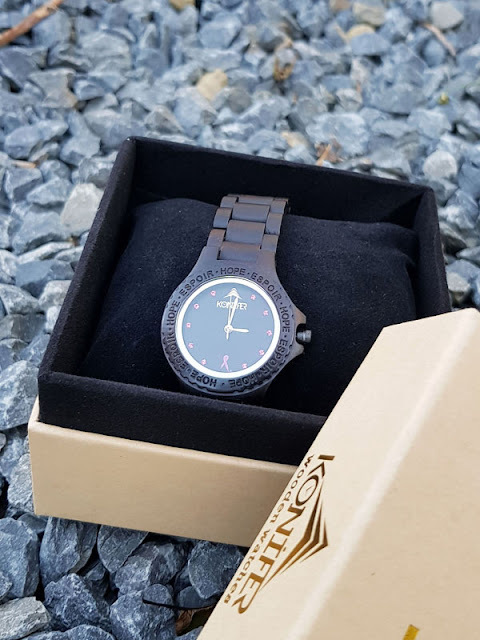 While I was itching to snag a watch with the pretty maple leaf design, I opted instead for this Pink Wooden Watch that supports breast cancer. The watch's face details the pink breast cancer ribbon. For every purchase of this watch, $5 goes to the Quebec breast cancer foundation. I chose this design because I felt like the pink Swarovski crystals on the watch's face stood out against the black ebony material. The face is engraved with the word "Hope" in English and in French. And of course, the pink breast cancer ribbon is there to symbolize what this watch design is dedicated to. I was also pleased to find out that Konifer uses Citizen Japanese movements for their watches. The 9" length of the strap was way too big for me. I wish I saw this guide on how to adjust the Konifer watch before I took these photos. Lol. I am personally a fan of wooden watches as they are so aesthetically pleasing and unique. This Konifer watch is no exception. As a lover of all things pink, I love the pink Swarovski details and the pink breast cancer ribbon detail. I also applaud their commitment to support causes such as this and how it is a symbol of hope. I am also impressed by how lightweight the watch is - almost feels like you are not wearing anything on your wrist. The brand and packaging was also pretty. 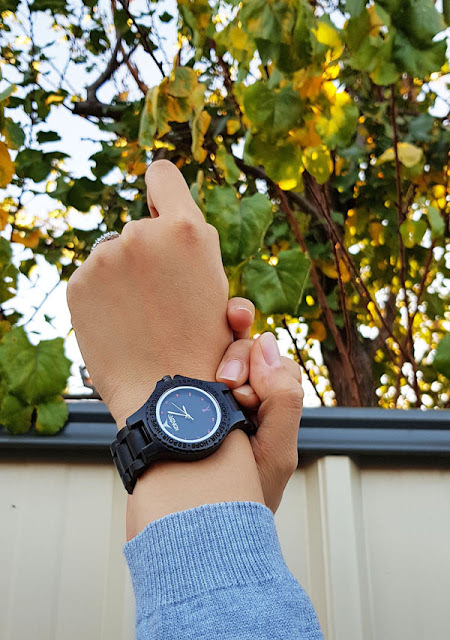 I felt like the material and design of the watch's clasp was a little too fragile for my taste (blame it on my rough and clumsy hands) - working completely well and functional though. Otherwise, the watch is completely reliable and pretty too. Also, it has a Citizen Japanese quartz movement which means it's quite practical and accurate. 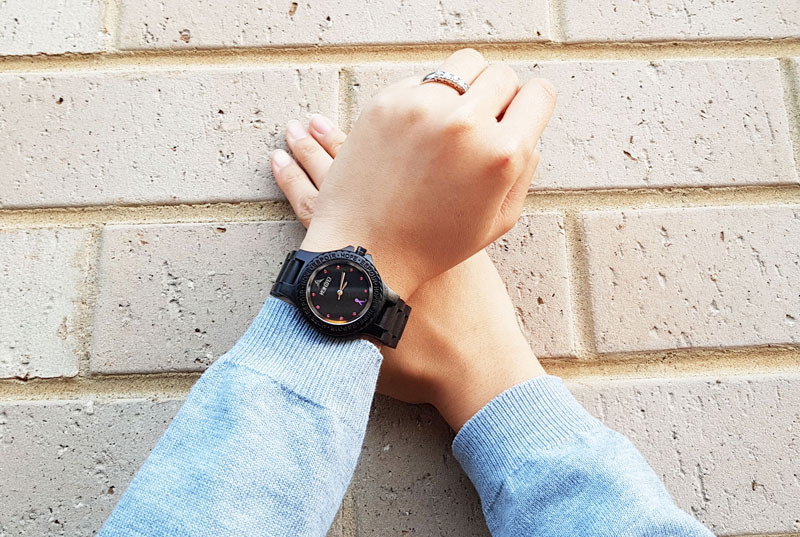 The watch is easy to wear and style into any outfit no matter the season. 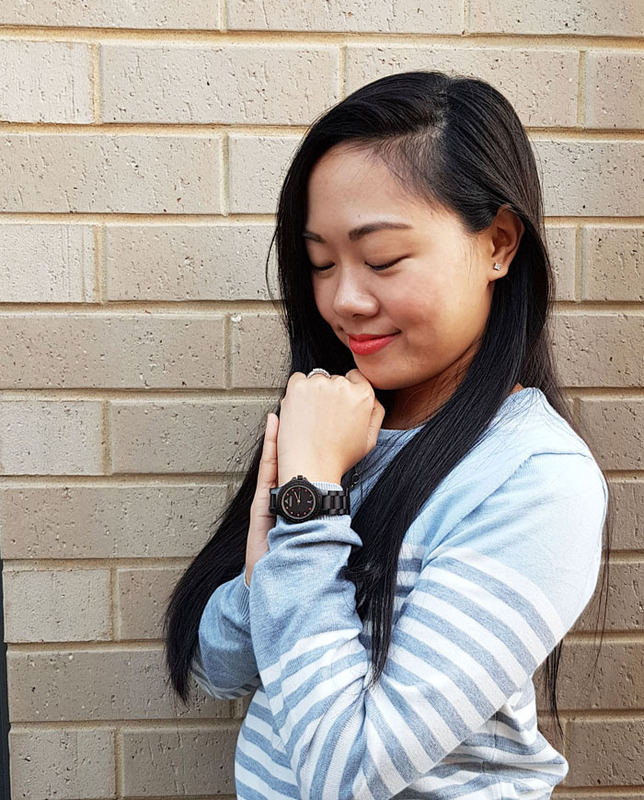 It's also so comfortable that you can wear it while lounging around the house like I did - and because it's so lightweight and durable, you can move easily and freely without having to worry. One more thing, for every watch sold by Konifer = 1 Tree Planted with Weforest. Konifer prides themselves for being eco-friendly after all. I definitely think all brands should make a commitment to being socially responsible so kudos to Konifer. What do you think about this watch design? How do you make an effort to support causes and become socially responsible? Woah, I love products with purpose. They can help mother nature by doing this. I'd love to give it a purchase soon. Thanks for the review! I like how they produce it for certain reason for the nature. This watch sounds amazing! I love that it is both stylish and functional! That is such a beautiful watch. I have been loving wooden watches lately! Such a simplistic and classic watch. Love the pink details against the black color too. 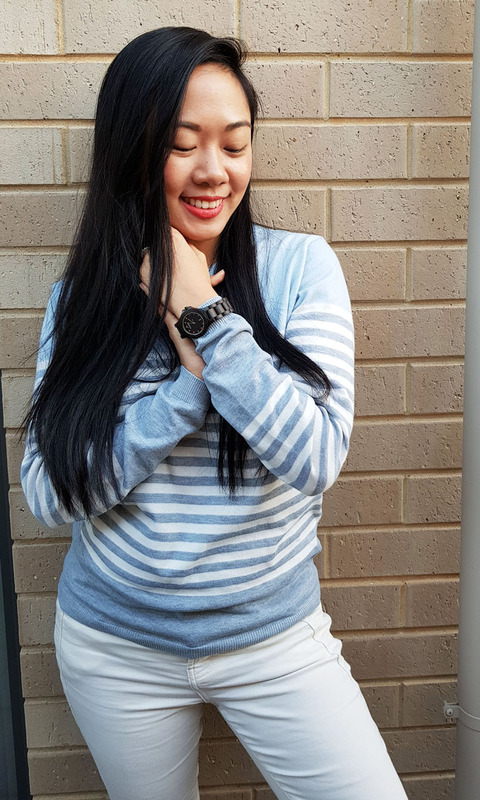 I have a couple of wooden watches from Jord, and I love them. I'd love to try Konifer too. Looks really good and high quality. Oooh I'm loving this watch! I've needed a new watch for a while now, and this looks like it would be pretty much perfect for me! Haven't heard of this brand before but really like this! I love this watch, they look so versatile! Nice review! I do really like that kinda watch that is designed so simple yet trendy. It is easy to be mix-and-matched with any kind of outfit. But above all, knowing that it has such positive movements as raising funds for breast cancer and 1 tree plant. omg. it's definitely worth it to buy. Beautiful watch :) Looks amazing. Wow, this watch is beautiful. Great review!